Easiest my favorite piece from the deYoung Museum is John Cederquist‘s Conservation Chair, created in 1998. This thing was absolutely mind-blowing, and it was definitely interesting to hear an intelligent 8 year old girl (who was later reprimanded by her mother for asking what a “rave” was) give her analysis about the great perspective used in the chair. Visit his website at johncederquist.com to see more of his mind-blowing work. We didn’t get permission to post the images, or we would. But. GO. It will not disappoint. 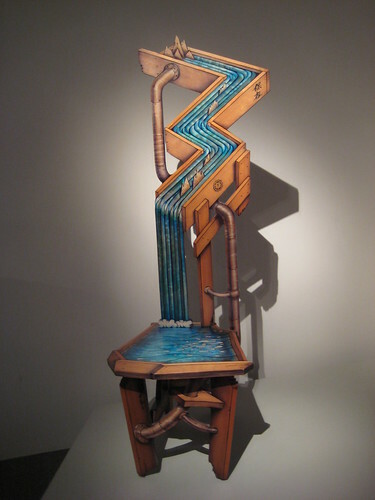 This entry was posted in California, Furniture, Paintings, San Francisco, Wood Carving and tagged conservation chair, deyoung gallery, deyoung museum, escher, furniture art, industrial design, japanese-inspired, john cederquist, mc escher, San Francisco. Bookmark the permalink.